Don't let the word "light" fool you into thinking this can't stand up to some bad weather. This shows all the typical excellence from MontBell that I've come to expect from their gear. I've used this jacket primarily for winter backpacking trips. My real test came during a 3 day lightweight trip up into the Glastenbury Wilderness in Vermont. The expected low was 0F* for the last night, and it was -18F* instead. This jacket really helped me out. Here's what I like about it. VALUE. This is not a cheap parka, but it is less expensive than other brands offerings in this type of parka. Excellent warmth and function for your dollars. Comfort is king, and this has little features like fleece-lined pockets and a roomy hood to let this parka come into its own. Weight. For only 13.5 ounces, and with almost 5 ounces of down, this parka puts out the warmth for under a pound. None really. Though if you anticipate going into temperatures below 0F* on a regular basis, I'd consider getting the Mirage Parka, which is MontBell's warmer offering. 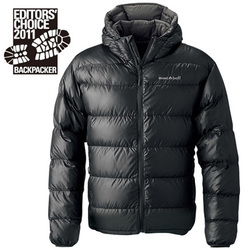 SUMMARY: Excellent product that I'd happily recommend to cold weather campers.